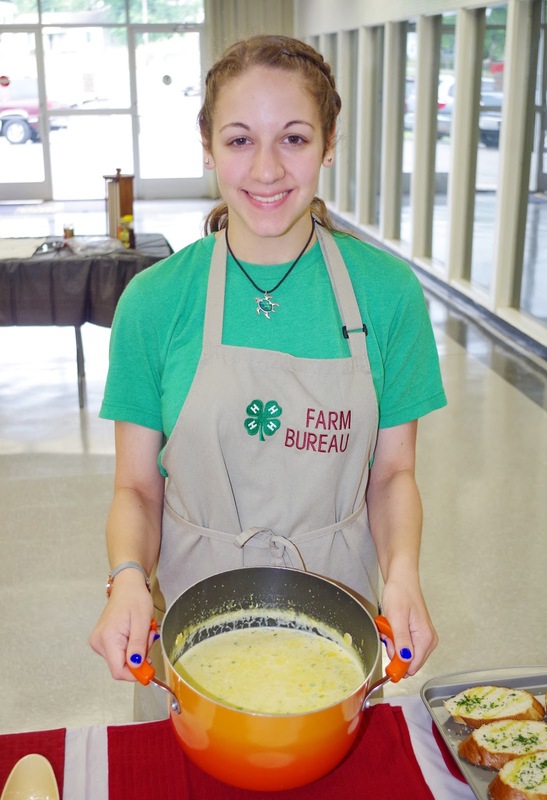 The Main Dish category winner of the 2016 Arkansas Farm Bureau Dairy Foods Contest is Christen Talley of El Dorado (Union County). Christen told us that she selected the recipe and modified it slightly because she wanted to use dairy products in a recipe that wasn't a dessert. 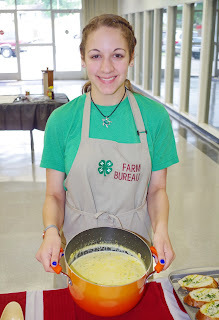 As we watched her prepare Cajun Corn and Crab Bisque last week during the contest in Little Rock, it was obvious that she developed a variety of culinary skills, especially her knife skills. Watching young people develop life skills and supporting them through volunteer activities like the Dairy Foods Contest is a rewarding experience for me. The other positive of being invited to judge the contest is the tasting of a lot of great dairy foods! In a large pot, melt butter. Add flour and brown lightly. Add onion, celery and carrots. Cook until vegetables are soft. Stir in garlic at the very end to keep it from overcooking. When vegetables are soft, stir in chicken stock,bay leaves, Cajun seasoning and corn. Bring to a boil and boil for 15 minutes. Remove the bay leaves. Reduce the heat and slowly stir in heavy cream,milk, and cream cheese. Add in half the green onions (retain half for garnish) and allow to return to almost boiling. Once heated through and cream cheese is completely melted, combine into bisque. Add liquid crab boil, salt and pepper to taste. Fold in crabmeat (if you stir too much, the crab falls apart). Serve immediately garnished with diced green onion.